This reading practice simulates one part of the IELTS Academic Reading test. You should spend about twenty minutes on it. Read the passage and answer questions 15-30. Look at the following List of descriptions (Questions 15-20) and Statements below. Match statements with the appropriate descriptions. Write the correct number A-C in boxes Questions 15-20 on your answer sheet. Write your answers in 21-23 on your answer sheet. The Chek Lap Kok island will be partially protected from storms by Lantau island and and also by . Further settlement caused by will be prevented by the use of . 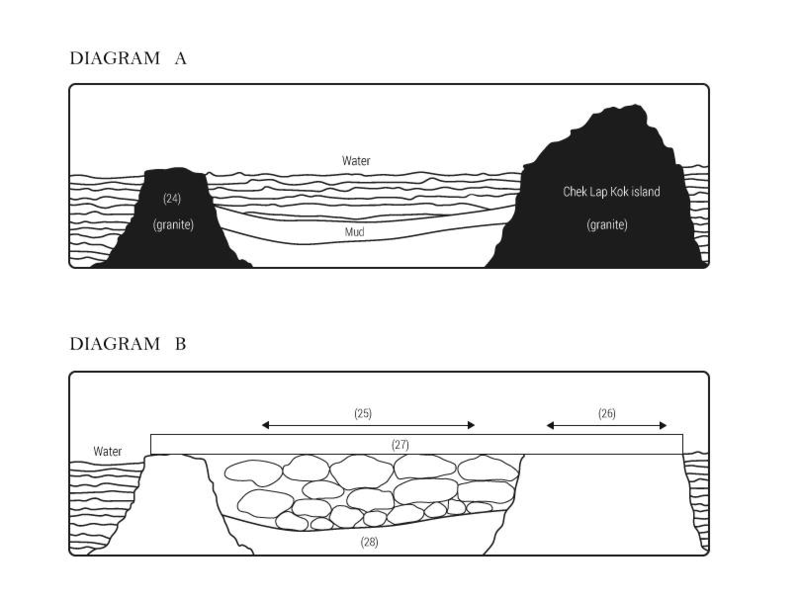 Diagram A is the cross-section of the original area around Chek Lap Kok before work began. Diagram B is the cross-section of the area around Chek Lap Kok after work. Complete the labels on Diagram A and B below. Write your answers in boxes 29-30 on your answer sheet. Which TWO of the following are stated about Kansai? It was built one kilometre offshore. It was built in a Osaka Bay. Sea defenses were placed above it. Below it was a fragile glacial deposit. A river delta is a landform that forms from deposition of sediment that is carried by a river as the flow leaves its mouth and enters slower-moving or stagnant water. This often occurs where a river enters an ocean. The river builds them up, the sea wears them down; their outlines are always changing. The changes in China's Pearl River delta, however, are more dramatic than these natural fluctuations. An island six kilometres long and with a total area of 1248 hectares is being created there. And the civil engineers are as interested in performance as in speed and size. This is a bit of the delta that they want to endure. Chek Lap Kok is an island in China's Pearl River delta. It was assimilated via land reclamation into the 12.48 square kilometres island for the current Hong Kong International Airport. As the new of Chek Lap Kok rose, however, another new Asian island was sinking back into the sea. This is a 520-hectare island built in Osaka Bay, Japan, that serves as the platform for the new Kansai airport. Chek Lap Kok was built in a different way, and thus hopes to avoid the same sinking fate. The conventional way to reclaim land is to pile sand rock on to the seabed. When the seabed oozes with mud, this is rather like placing a textbook on a wet sponge: the weight squeezes the water out, causing both water and sponge to settle lower. The settlement is rarely even: different parts sink at different rates. So buildings, pipes, roads and so on tend to buckle and crack. You can engineer around these problems, or you can engineer them out. Kansai took the first approach; Chek Lap Kok is taking the second. The differences are both political and geological. Kansai was supposed to be built just one kilometre offshore, where the seabed is quite solid. Fishermen protested, and the site was shifted a further five kilometres. That put it in deeper water (around 20 metres) and above a seabed that consisted of 20 metres of soft alluvial silt and mud deposits. Worse, below it was a not-very- firm glacial deposit hundreds of metres thick. The Kansai builders recognised that settlement was inevitable. Sand was driven into the seabed to strengthen it before the landfill was piled on top, in an attempt to slow the process; but this has not been as effective as had been hoped. To cope with settlement, Kansai's giant terminal is supported on 900 pillars. Each of them can be individually jacked up, allowing wedges to be added underneath. That is meant to keep the building level. But it could be a tricky task. Conditions are different at Chek Lap Kok. There was some land there to begin with, the original little island of Chek Lap Kok and a smaller outcrop called Lam Chau. Between them, these two outcrops of hard, weathered granite make up a quarter of the new island's surface area. Unfortunately, between the islands there was a layer of soft mud, 27 metres thick in places. According to Frans Uiterwijk, a Dutchman who is the project's reclamation director, it would have been possible to leave this mud below the reclaimed land, and to deal with the resulting settlement by the Kansai method. But the consortium that won the contract for the island opted for a more aggressive approach. It assembled the world's largest fleet of dredgers, which sucked up 150m cubic metres of clay and mud and dumped it in deeper waters. At the same time, sand was dredged from the waters and piled on top of the layer of stiff clay that the massive dredging had laid bare. Nor was the sand the only thing used. The original granite island which had hills up to 120 metres high was drilled and blasted into boulders no bigger than two metres in diameter. This provided 70m cubic metres of granite to add to the island's foundations. Because the heap of boulders does not fill the space perfectly, this represents the equivalent of 105m cubic metres of landfill. Most of the rock will become the foundations for the airport's runways and its taxiways. The sand dredged from the waters will also be used to provide a two-metre capping layer over the granite platform. This makes it easier for utilities to dig trenches - granite is unyielding stuff. Most of the terminal buildings will be placed above the site of the existing island. Only a limited amount of pile-driving is needed to support building foundations above softer areas. The completed island will be six to seven metres above sea level. In all, 350m cubic metres of material will have been moved. And much of it, like the overloads, has to be moved several times before reaching its final resting place. For example, there has to be a motorway capable of carrying 150-tonne dump-trucks; and there has to be a raised area for the 15,000 construction workers. These are temporary; they will be removed when the airport is finished. The airport, though, is here to stay. To protect it, the new coastline is being bolstered with a formidable twelve kilometres of sea defences. The brunt of a typhoon will be deflected by the neighbouring island of Lantau; the sea walls should guard against the rest. Gentler but more persistent bad weather - the downpours of the summer monsoon - is also being taken into account. A mat-like material called geotextile is being laid across the island to separate the rock and sand layers. That will stop sand particles from being washed into the rock voids, and so causing further settlement. This island is being built never to be sunk.